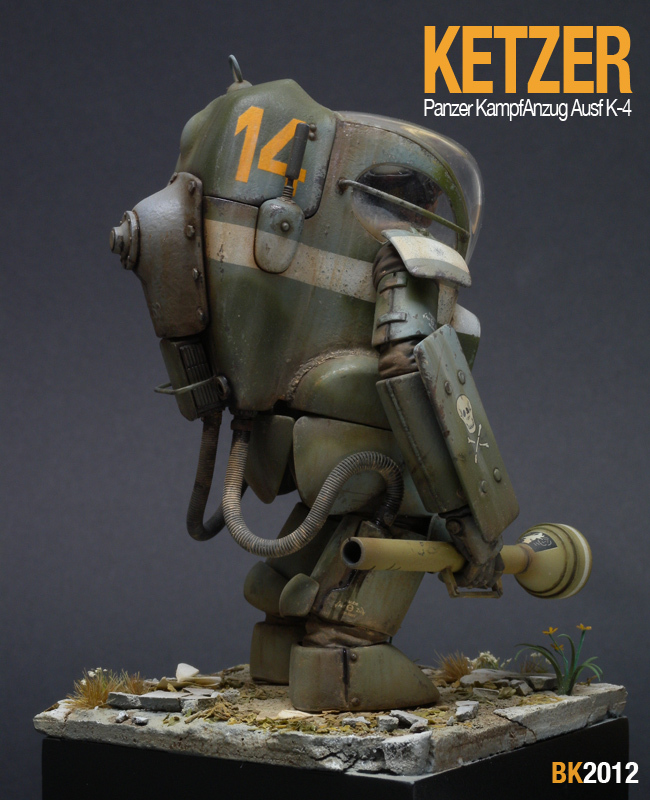 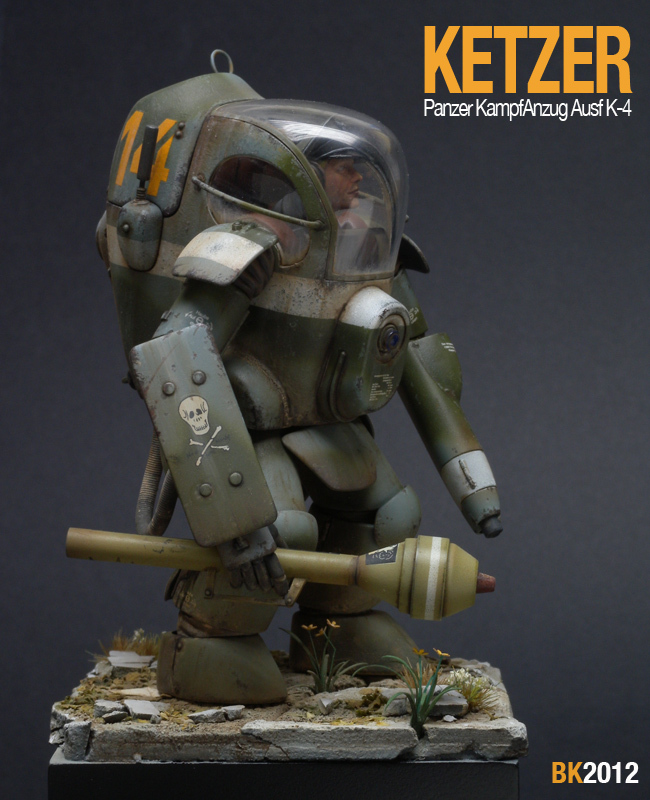 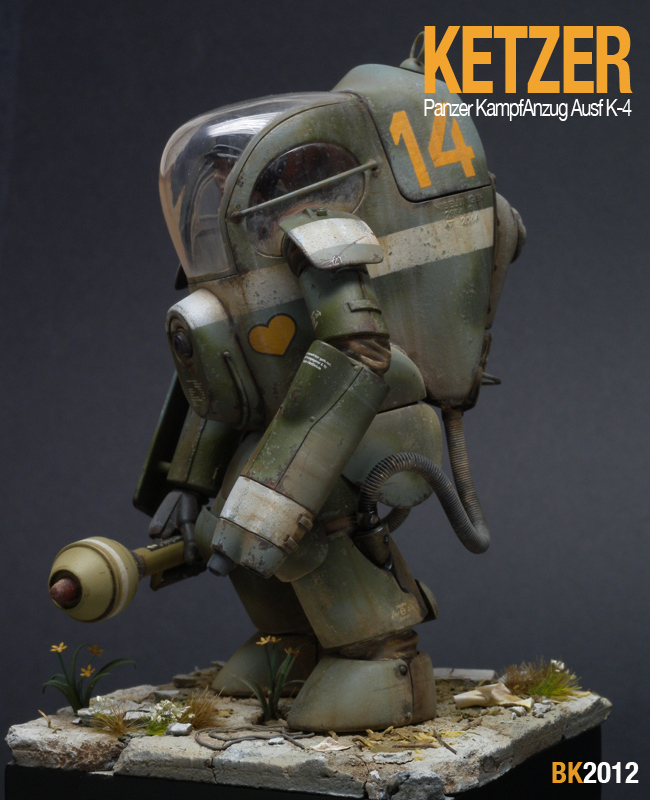 Wave has recently released the PKA Ausf K Ketzer. 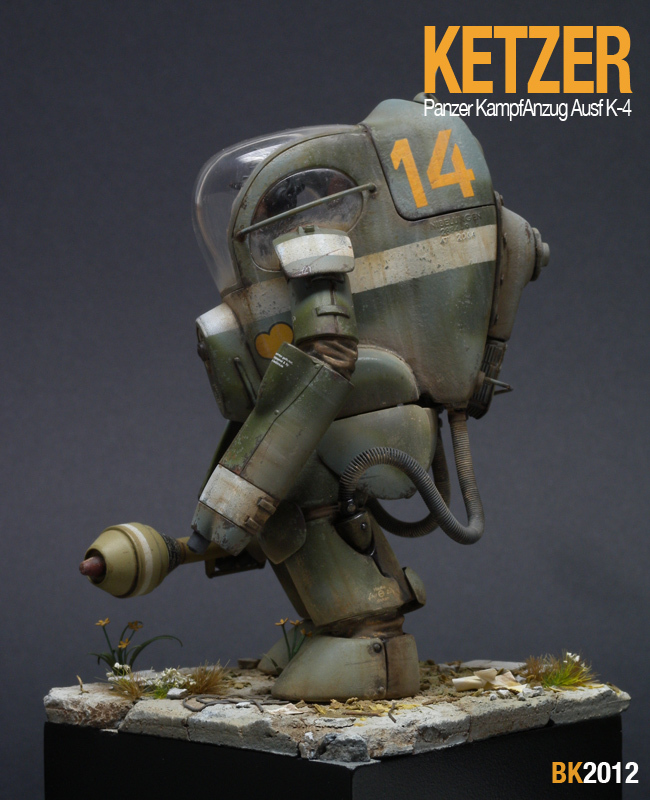 The Ketzer is an improved version of the Konrad with enhanced engine silencer for clandestine operations. 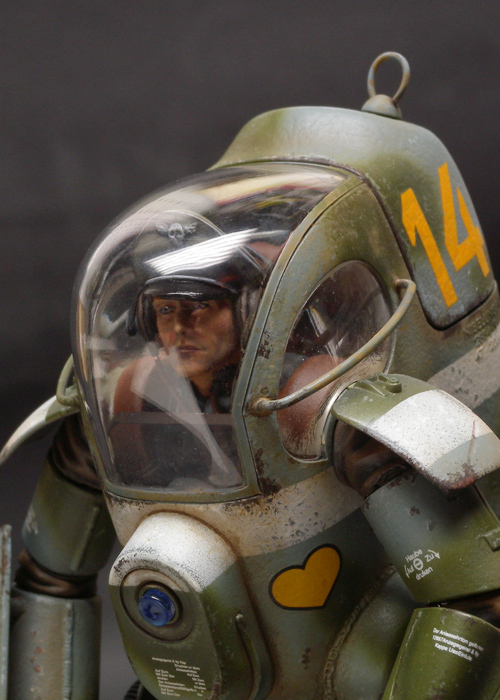 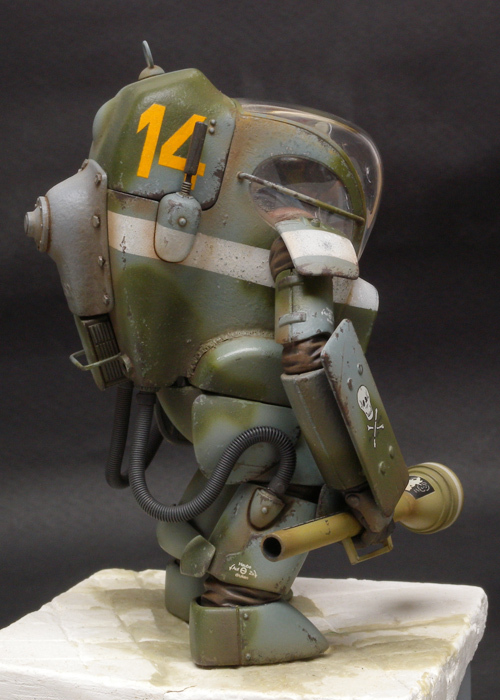 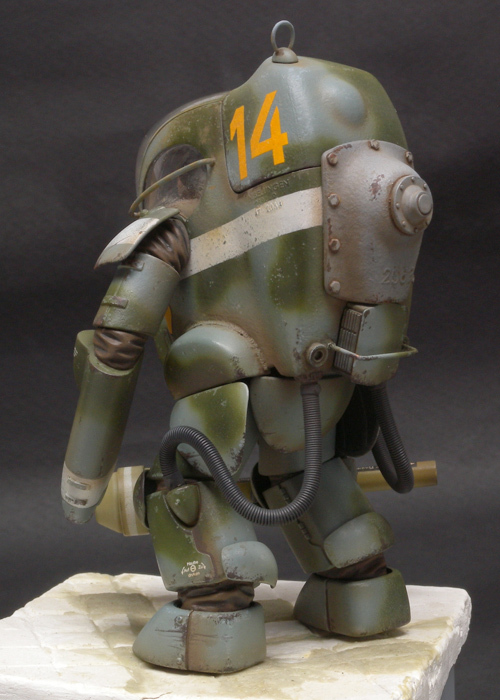 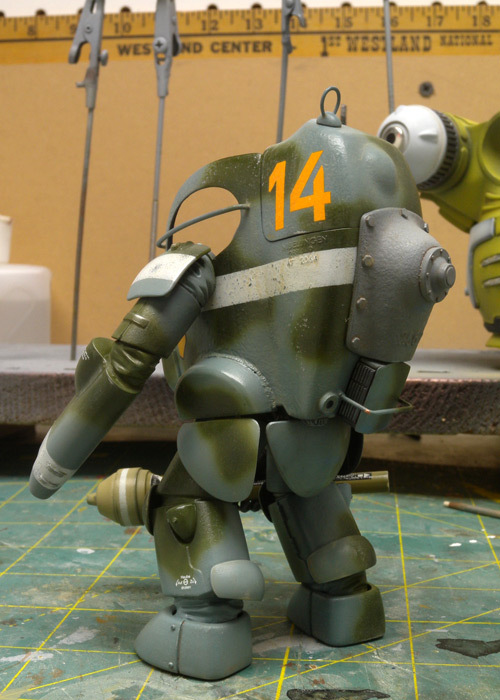 The Konrad first appeared along with the Gucker and Kuster on Kow's web site and then in a following issue of Model Graphixs. 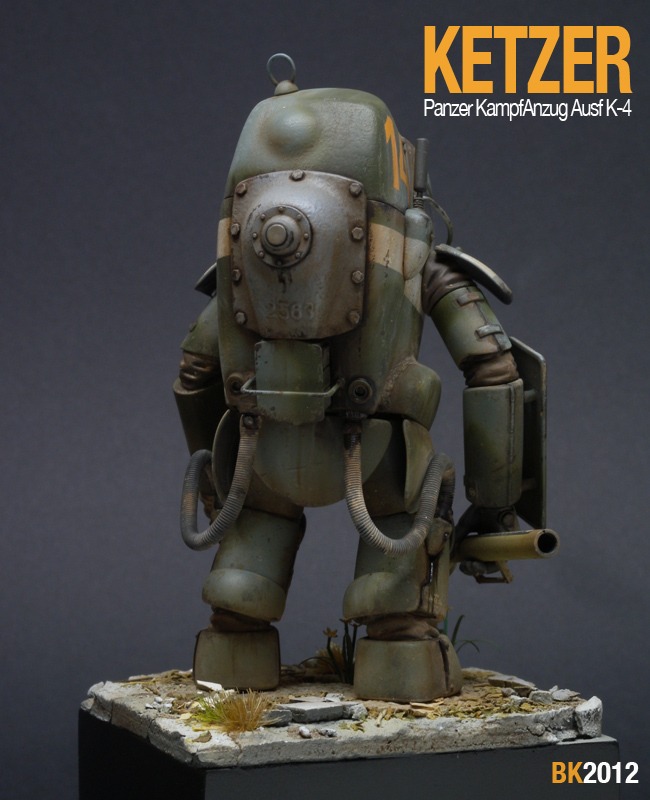 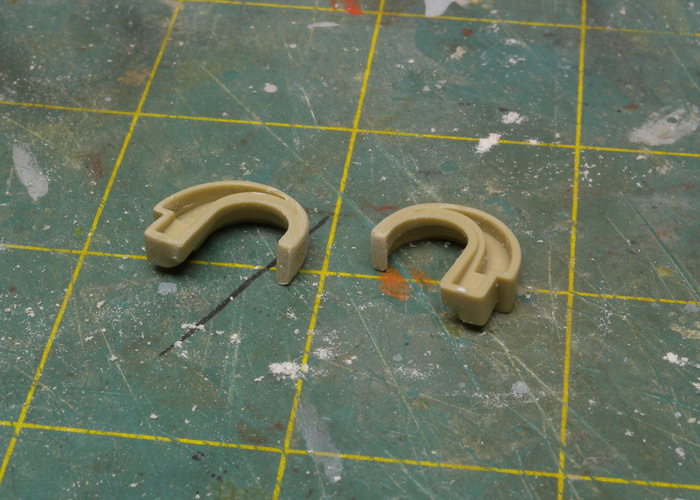 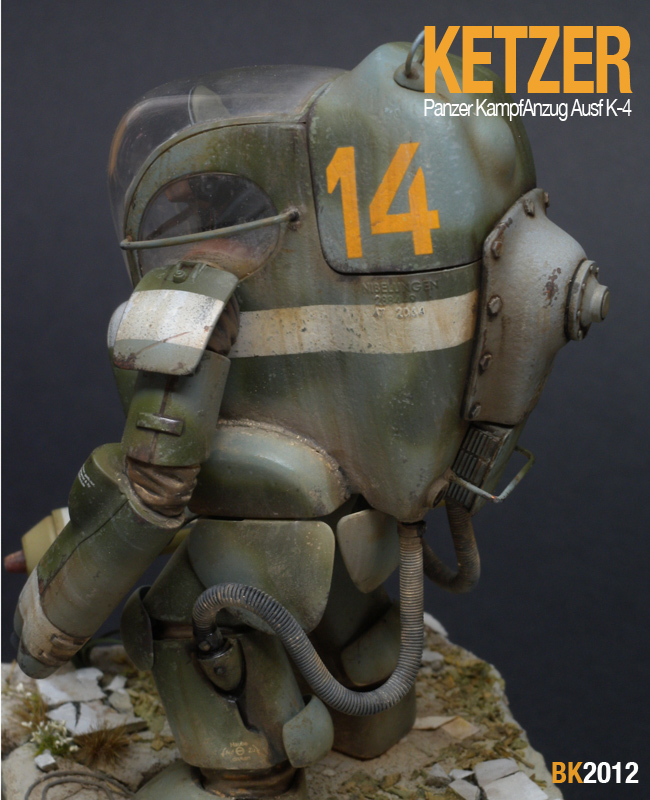 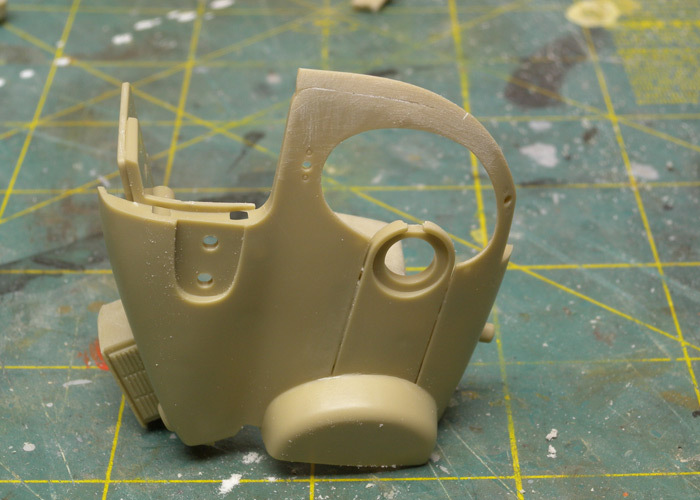 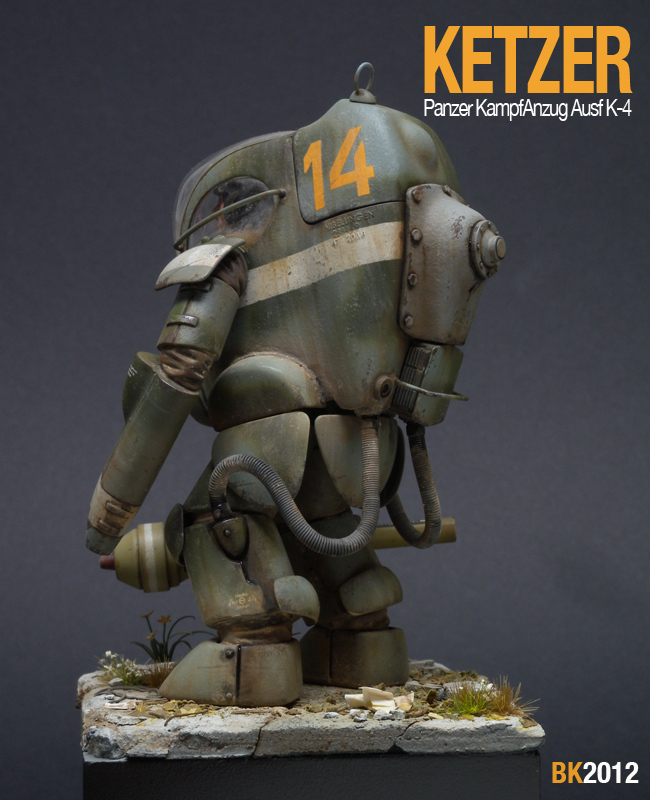 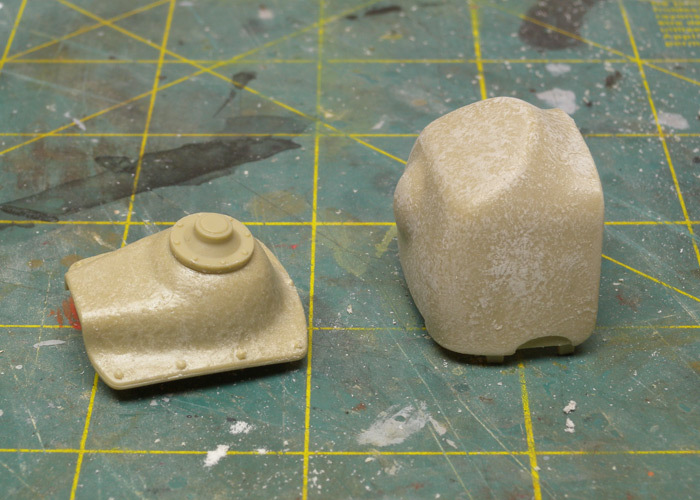 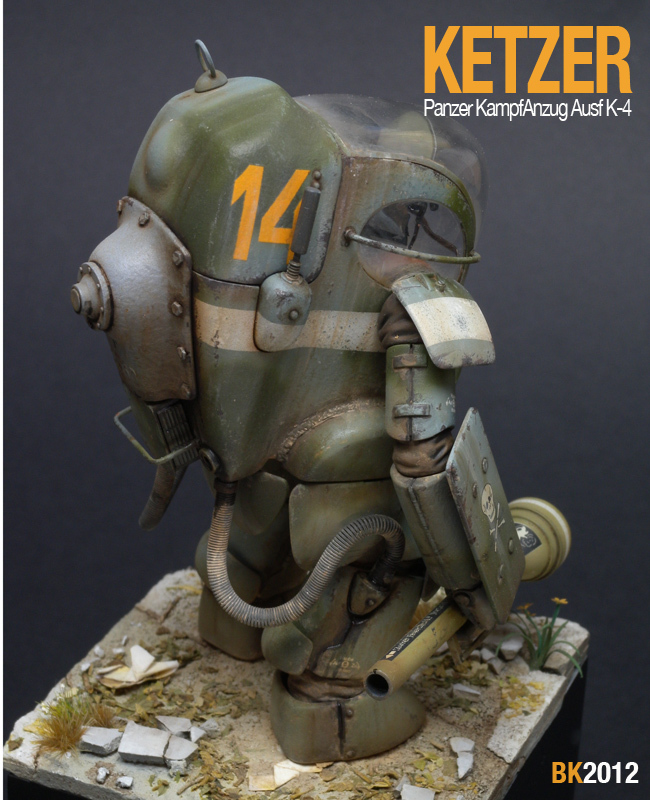 The Ketzer has not been released as a kit before so it made sence that this PKA varient would be the first release from Wave's new Ausf G/K tooling. 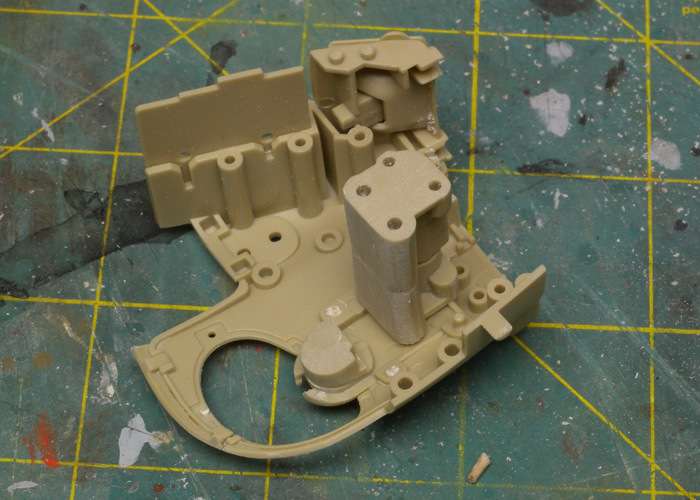 The engineering is very good on this kit and I built it more or less out of the box with a few changes. 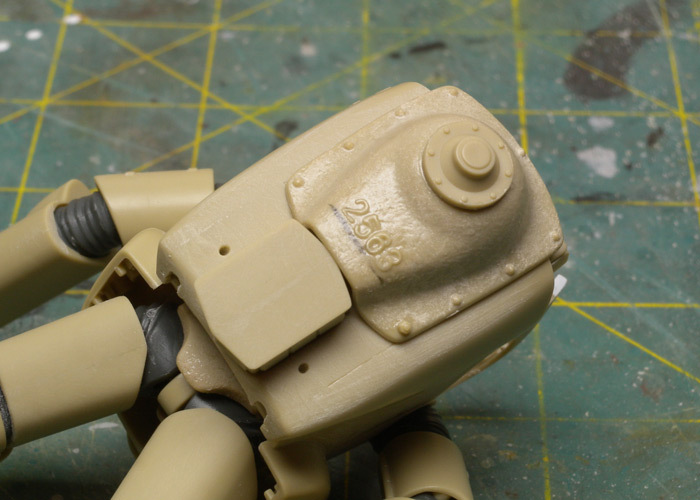 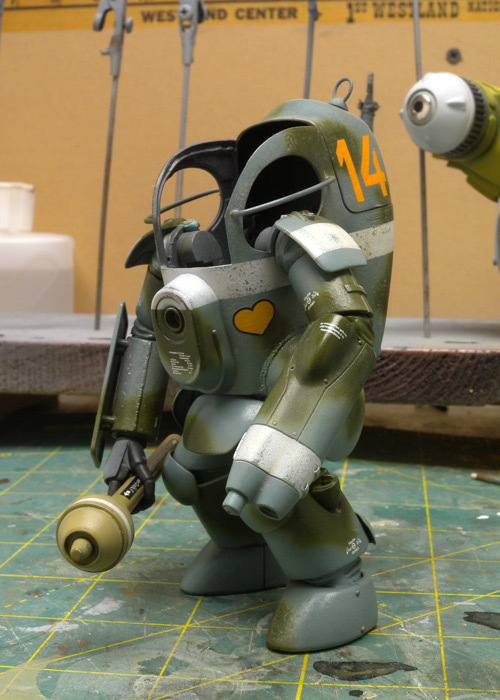 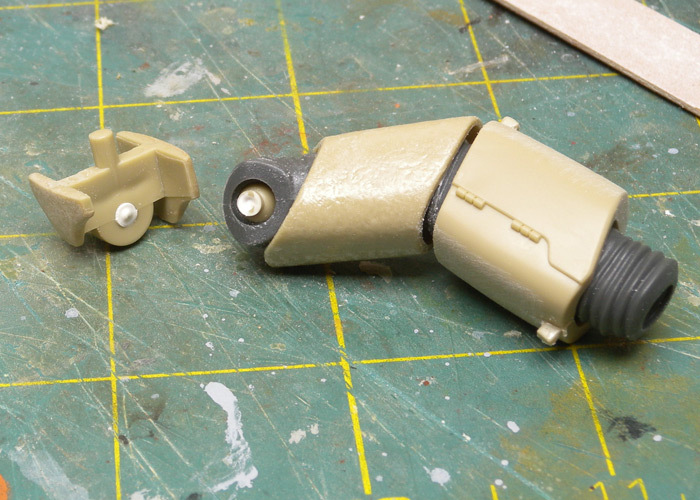 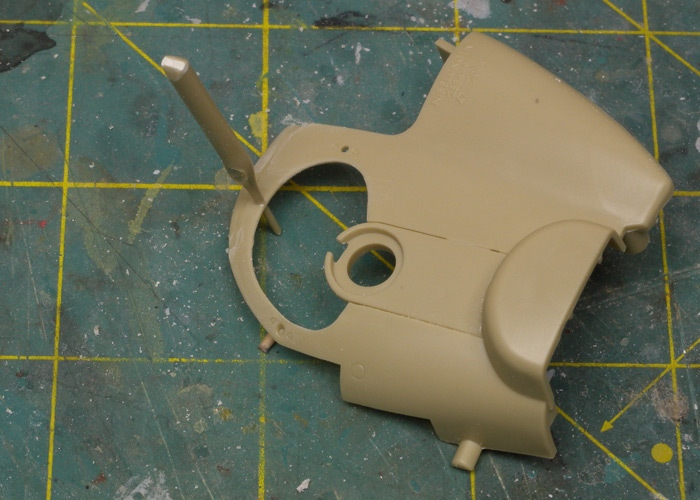 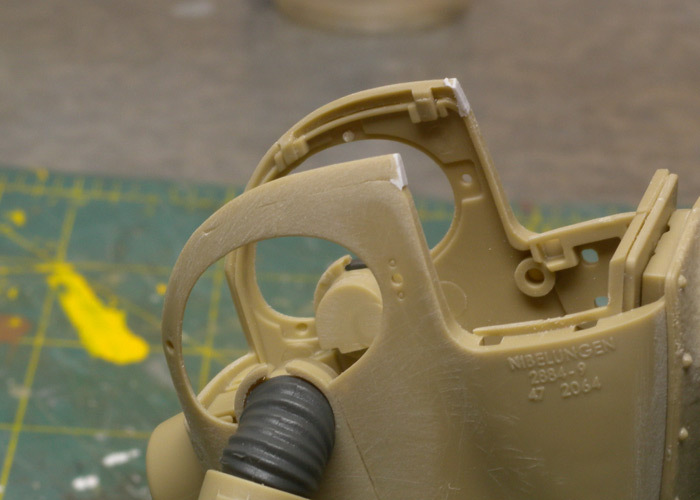 The main modification at this point was chopping up the center hub in the torso to allow parts to be slipped in after painting. 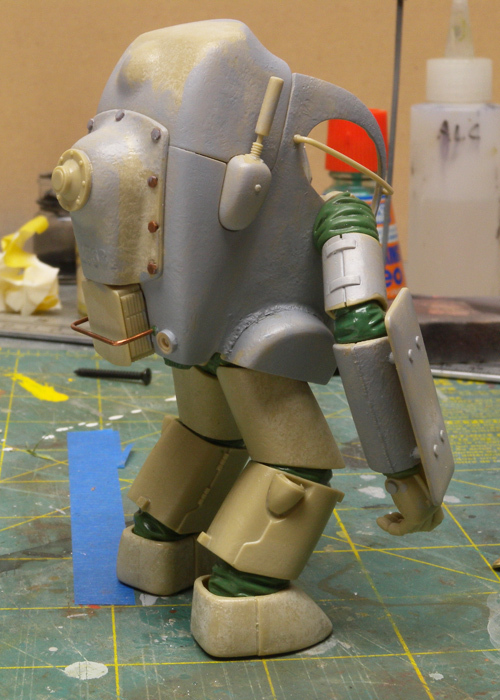 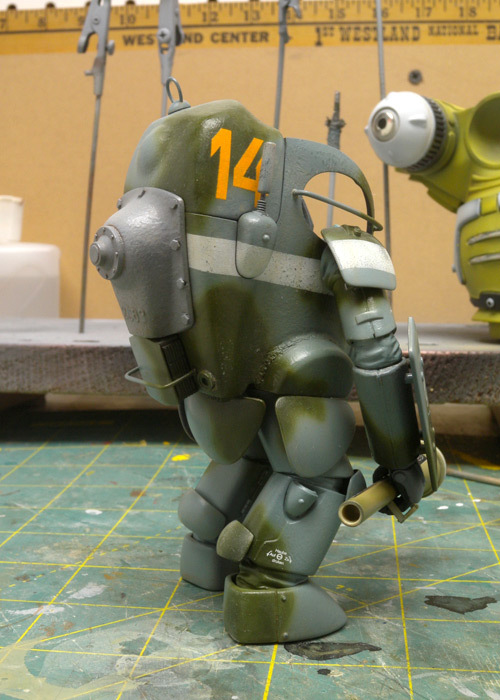 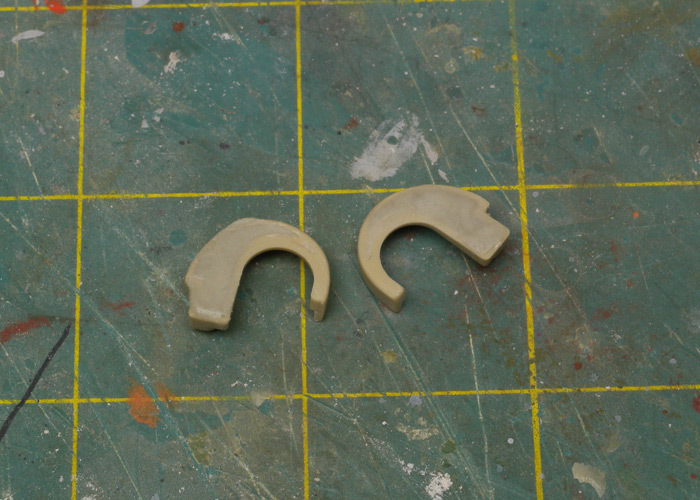 I also sculpted Green Stuff over the kit supplied PE joints. 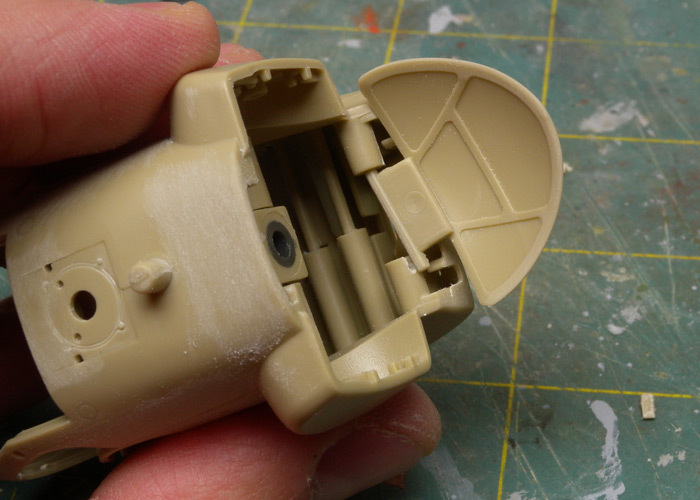 This allowed some flexibility after assembly and avoided paint flaking off later. 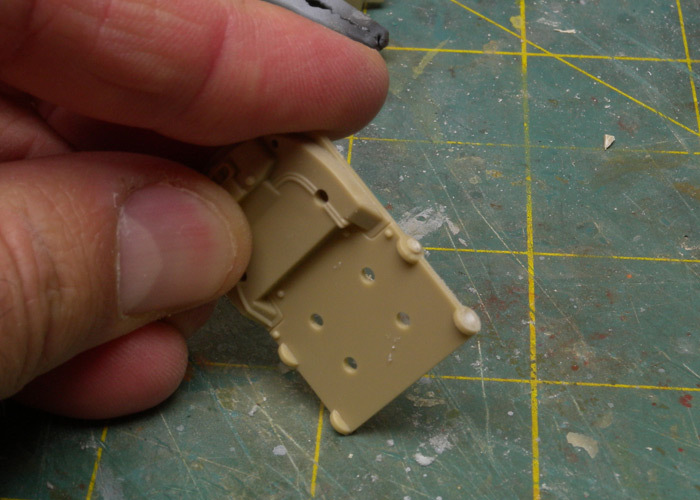 I also textured the hull and eliminated some of the panel lines from the modular kit design. 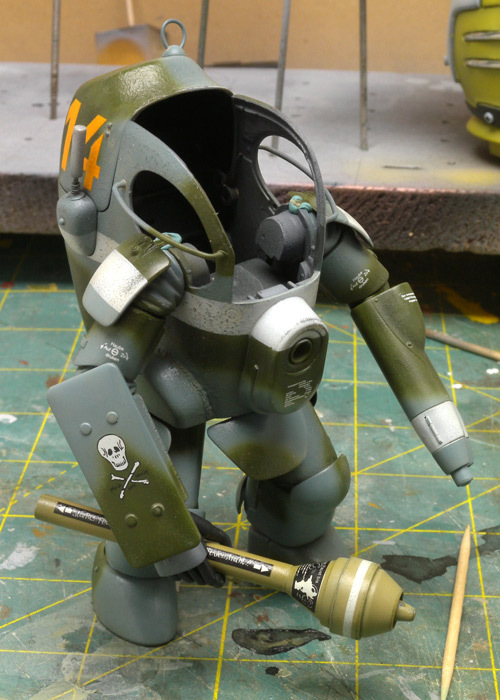 I've always liked the paint scheme from the original Konrad box art and decided to replicate that scheme on this model. 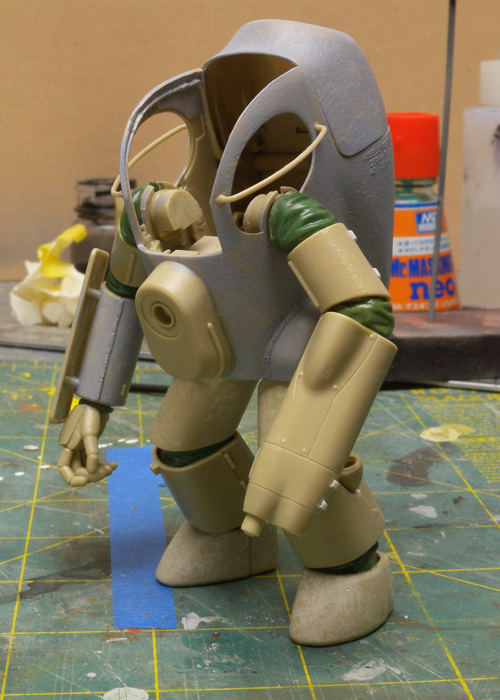 The figure shown is not the one from the kit. 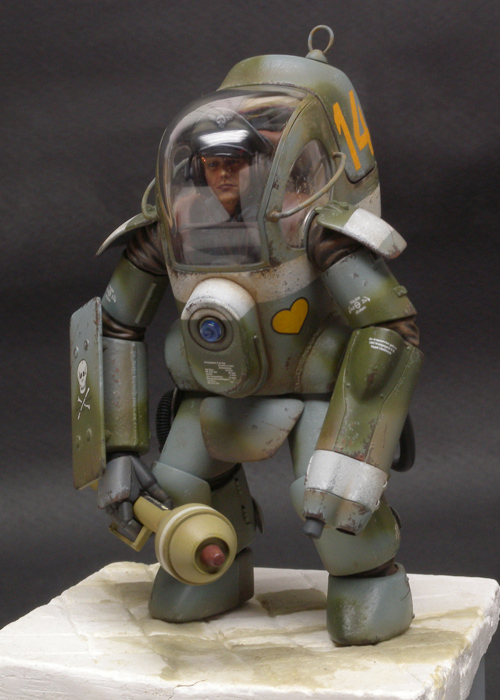 This is a replacement bust from LoveLoveGarden that was released several years ago at one of the Japanese Wonder Festivals. 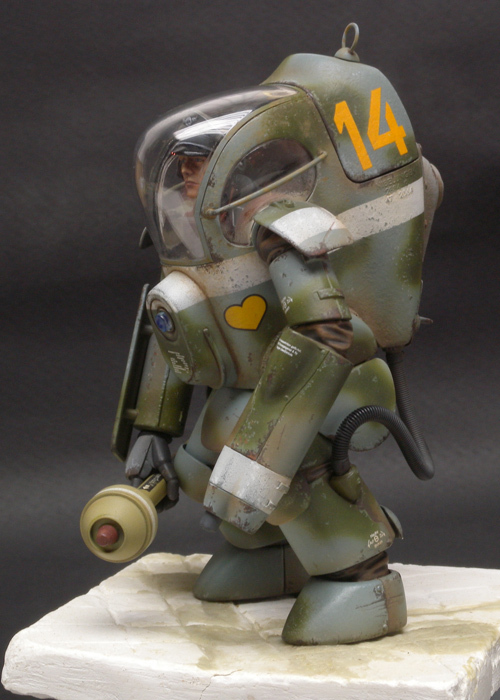 I think there was only one issue of this, so it is very rare. 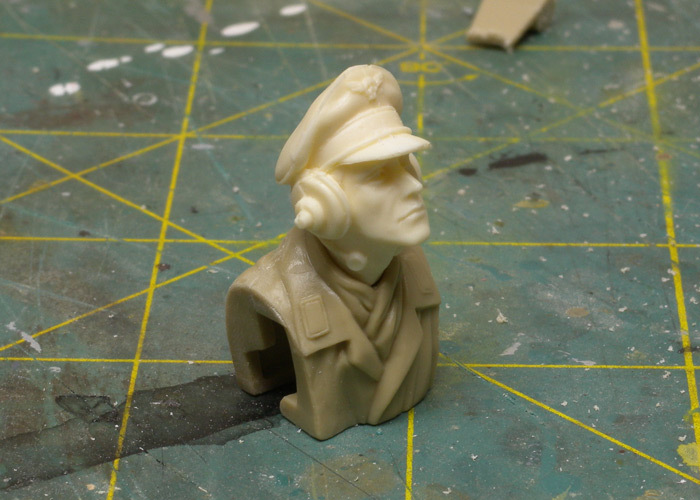 I created the head gear from wire and styrene with solder wire for the headphone and throat mic wiring. 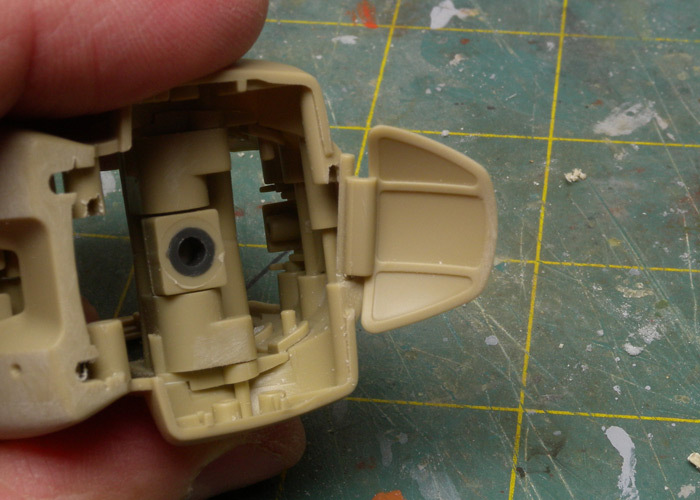 Unfortunatley most of this fine detail is hidden by the glare.